You are here: Home / Jewelry / Art Deco Cartier carved emerald bead necklace. 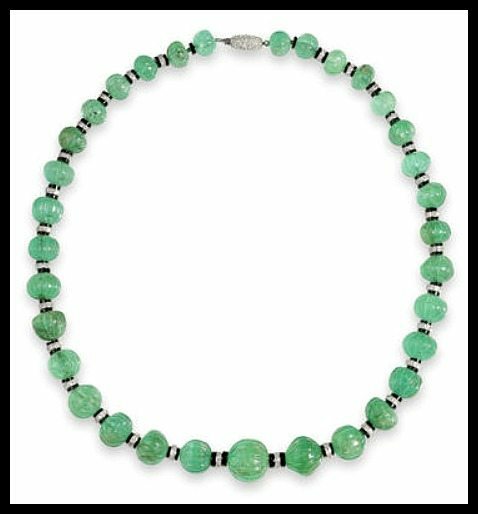 Art Deco Cartier carved emerald bead necklace. The Cartier carved emerald bead necklace you are about to admire is a perfectly proportioned masterpiece of colors, textures, and shapes. Cartier carved emeralds are famous, and it’s not hard to see why. The Indian-inspired carved emeralds began to appear in Cartier’s jewels in earnest after Jacques Cartier visited India in 1911 and had a chance to examine the jewels of several wealthy maharajahs. This necklace dates to 1925, shortly after that inspiring journey. With its juicy carved emeralds and geometric diamond/onyx spacers, it’s a glorious meeting of Indian-inspired gemstones and the typical Art Deco aesthetic. 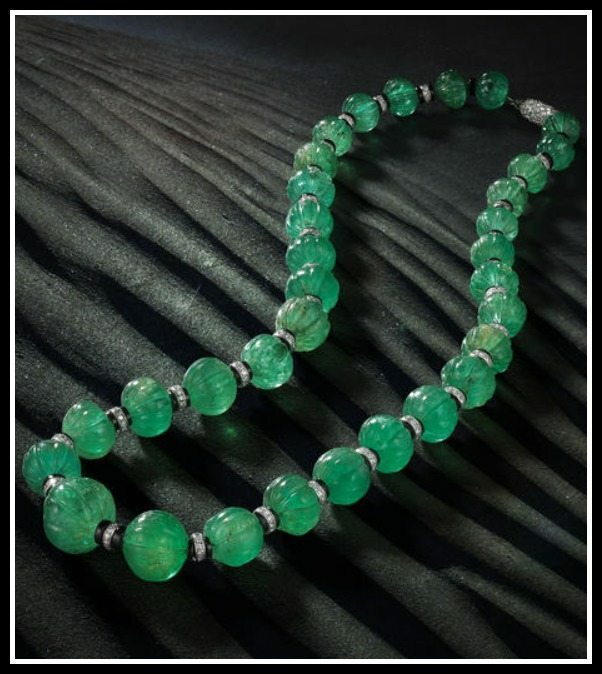 This necklace features 32 exquisitely fluted emerald beads. The beads are graduated, meaning they are smaller towards the back of the necklace and gradually increase in size around to the front. Between each emerald bead is a an onyx and single-cut diamond rondell spacer, which lends the piece its vivid color contrast. I figured you’d want a closer look. The cherry on top of this piece is the lovely elongated clasp pavé-set with rose-cut diamonds. Because it wasn’t pretty enough already. Oh, Cartier. You weaken my knees every time. What do you think of this Art Deco piece? Does it float your boat? 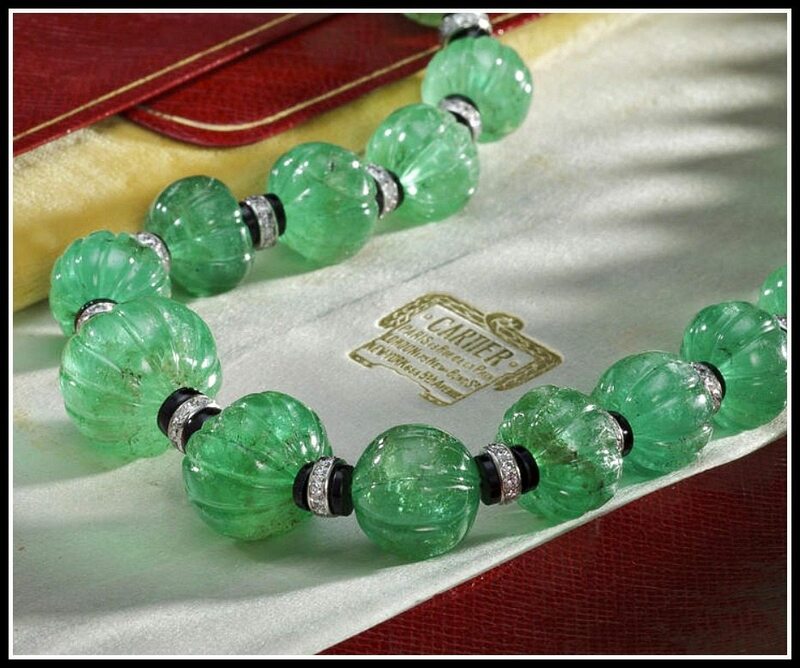 This Cartier carved emerald bead necklace was listed in a 2011 Bonhams auction. All images and info are thanks to Bonhams.